Sandwich mash-ups: We're all about them (see exhibits A, B and C). Now we’ve got another to add to the list: the cubano/panino hybrid. 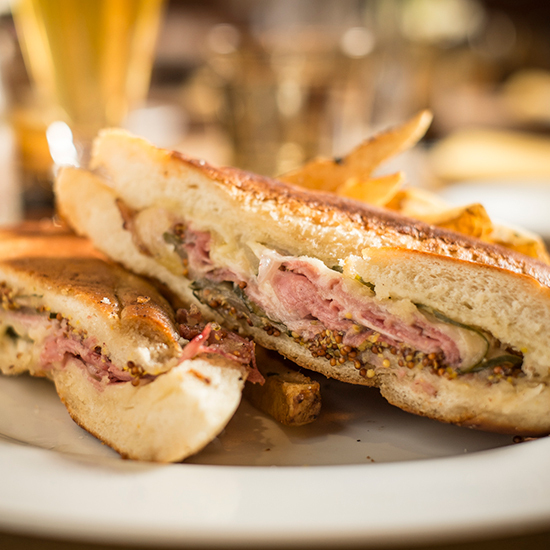 At Osteria Moorestown, Marc Vetri's trattoria outside Philadelphia, chef-partner Brad Spence takes the cubano format (pork, Swiss, mustard, pickles) and Italianizes it with house-made porchetta—one of the best sandwich ideas we've heard in a long time. The bread. Baked in-house, it's a classic cubano-style long roll—crusty and sturdy enough to support a whole lotta pig. The filling. The key ingredient: porchetta that the restaurant makes just for this sandwich. The tonnato sauce is a creamy, mayo-like condiment that uses Sicilian tuna as its base. (Trust us, you want this.) And to make it a cubano, there are the essentials: Swiss, pickles and grain mustard. "Marc [Vetri] and I were on a trip to Miami for a charity event," says Spence, "and our friend Paul Kahan was serving it." Kahan, for the uninitiated, is the Chicago meat-and-sandwich-and-everything-else guru behind Publican Quality Meats, Avec and several more excellent restaurants. "We more or less ripped it off from him!” In fairness, we probably would, too.